 WHEN YOU BOUGHT A BRAND-NEW KAYAK AND ARE LOOKING TO GET TO THE LAKE OR RIVER, BUT HOW ARE YOU GOING TO GET YOUR KAYAKS OR CANOE TO THERE?  Maybe you could squeeze your kayak into your SUV and have it take up space in your vehicle, or you could try out a safer and more simple, quick way.  Vault Cargo's Kayak Carrier Roof Rack - the rack attaches directly to your cargo roof rack and safely quick cradles your Kayak, Canoe, Boat, Paddle Board, Surfboard on roof top of your vehicle. Leaving the much needed cargo space available in your SUV.  Each Kayak Rack folds down after use to allow you the convenience of keeping them on all season long.  This Kayak Carrier designed mounts to virtually all crossbars and load bars on the market, the carrier secures the kayak on its side, consuming minimal space on the load bar.  This also allows you to fit into your garage or Low clearance mouth, without having to remove them every time.  Accommodates kayaks up to 36inches wide and 75lbs.  Pair this with Vault Cargo's Roof Rack Cargo Bars and a set of Ratchet Straps and you have the safest quick solution for transporting your kayak or canoe.  EASY SOLUTION: Optimally sized J style carrier leaves roof space. Top mount your kayak, Canoe, Boat, Paddle Board, Surfboard to your vehicle's existing roof rack to save cargo space.  FOLDING TECHNULOGY: Wide mouth J-bar foldable racks kayak can quick on/off hardware ensures offers fast easier installation and unloading removal. When each J-bar folds down to allow your car to fit in parking garages not have to removal.  STEEL ALUMINUM DESIGN: Heavy duty steel and aluminum construction makes the racks light weight and last forever. Adjustable soft padding attached to each J-bar racks are make it non-rub for carrying strength and kayak protection prevent rubbing.  APPLY TO: Accommodates kayaks up to 36" wide and 75lbs. Will fit most factory or aftermarket round, square, oval and flat crossbars. Attach to Vault roof racks cross rails for an easy kaykak carrier cargo racks. 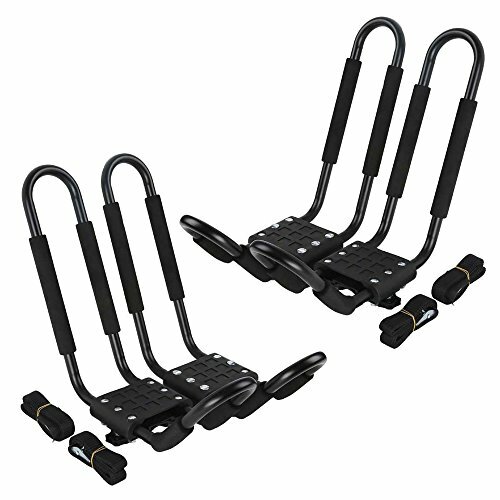  PACKAGE INCLUDES: 2 Pair Kayak Rack. (The crossbars shown in the pictures are not included. Please check measurements before purchase ). If you have any questions about this product by Sudoo, contact us by completing and submitting the form below. If you are looking for a specif part number, please include it with your message.